HSEE 2019 : The Humanities and Social Sciences Entrance Examination is Conducted by Indian Institute of Technology Madras for admission in a master programme offered by Humanities and Social Science. Latest Update:The HSEE 2019 Application Form has been released!! Fill the form before last date. HSEE is a National level examination for those students who want to take admission in five years integrated master of arts. The HSEE Application Form has been released by the department. HSEE 2019 exam will be held on Sunday, 21st April 2019. All the important dates related to HSEE 2019 are mention below in a tabular form. The HSEE Notification is also available on the Official website. The candidates who are interested in HSEE 2019 must fill the application form before 23rd January 2019. 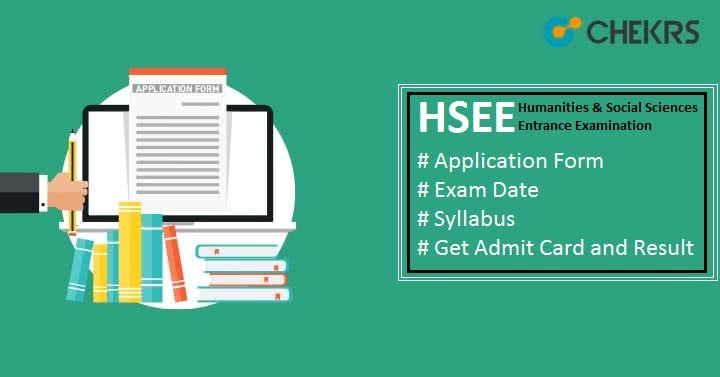 Go through this page for the details related to HSEE 2019 such as application form, eligibility criteria, fee structure, admit card, result etc. Application form for Humanities and Social Sciences Entrance Examination has released by Indian Institute of Technology Madras on the official website. HSEE 2019 application form is available online. Interested candidates can fill it before or till 23rd January 2019. To know all the details about, how to fill the HSEE Application Form refer to this page. First of all, visit the official website http://hsee.iitm.ac.in/. Now click on a link- Click here for online registration and you see HSEE 2019 Online Application portal is opened in front of you. Read all the instructions carefully before registration. Click on Proceed to online apply. New user clicks on “Login Here” button for registration. HSEE registration form is opened in front of you. Enter all the required information such as name, phone number, email id, date of birth etc carefully and click on register button. After registration goes back to the login page and Log in with your registered id and password. Enter all the necessary details such as personal details, academic details, examination details. Make sure that all the information are correct. When all the details are entered click on the Continue button. Now upload your photos and documents. Click on the Upload button, and upload scanned signature, passport size photo and required documents (Below in article all the required documents are given). The last step is pay examination fee. To complete the application process pay Fee through Indian bank e-challan or through Net banking/ Credit card/ debit card. The examination fee must be paid either through Net banking/Credit card or through the Indian Bank Challen. The service charge of Rs. 40/- is taken by the bank. Following documents are required to attach with application form of Humanities and Social Sciences Entrance Examination. HSEE Syllabus is easily available online on the official website, but if you want more crystal clear information then we will provide you here. The basic detail is that the HSEE 2019 will have two parts: Part I and Part II. Part I Syllabus consists of English (25% marks), Analytical and Quantitative Ability (25% marks), and General Studies (in four sub-parts; 50% marks). Whereas Part II is just essay writing. HSEE 2019 Admit Card will be released by Indian Institute of Technology Madras on the official website http://hsee.iitm.ac.in/. Admit card is available only online. It will not send by email or post to anyone. candidates can download it from website between 20th March 2019 to 21st April 2019. The Result will be declared after the completion of the computer-based test. HSEE 2019 Result will be declared online by the education authority. The merit list will also be released category wise. Now enter your registration id and password. The result is in front of you check it and download it for your future use. candidates can also take print out of the result. In the above article, we have provided all the essential information related to HSEE 2019 such as application form, exam dates, fee structure, admit card, result etc. Guys if you have any query in your mind regarding HSEE Entrance exam then just comment us in comment box given below.